Ever wanted the Facial Recognition technology used by the FBI at your finger tips? Well that dream is a little hard to satisfy, but what I can give you is Face.com’s Photo Finder – a Facial Recognition tool for Facebook. 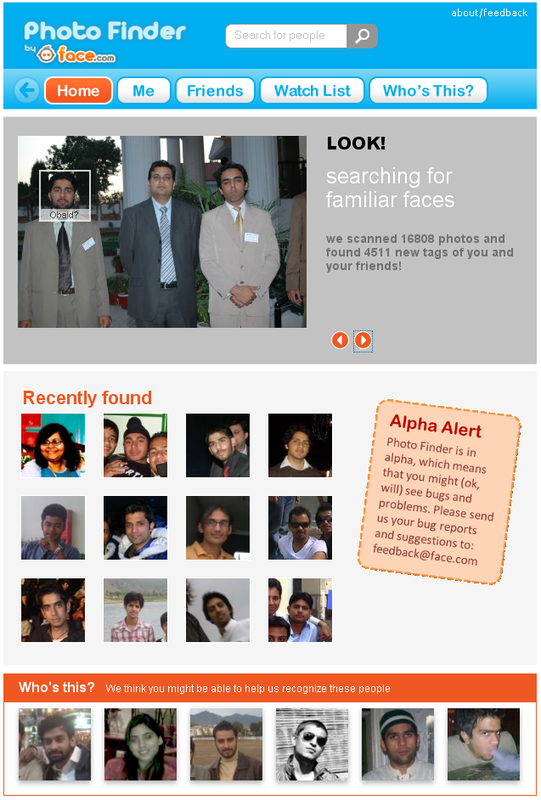 Photo Finder uses advanced Facial Recognition algorithms and existing Facebook photos and tags to identify you and your friends around Facebook. The technology, though not as powerful as you see in the movies, is quite neat and works out great most of the time. Photo Finder downloads and analyzes all the photos of you and your connections. It checks for tags and builds it database of images with the help of tags you put on people. The accuracy of identification is directly dependent on the tagging you did initially. 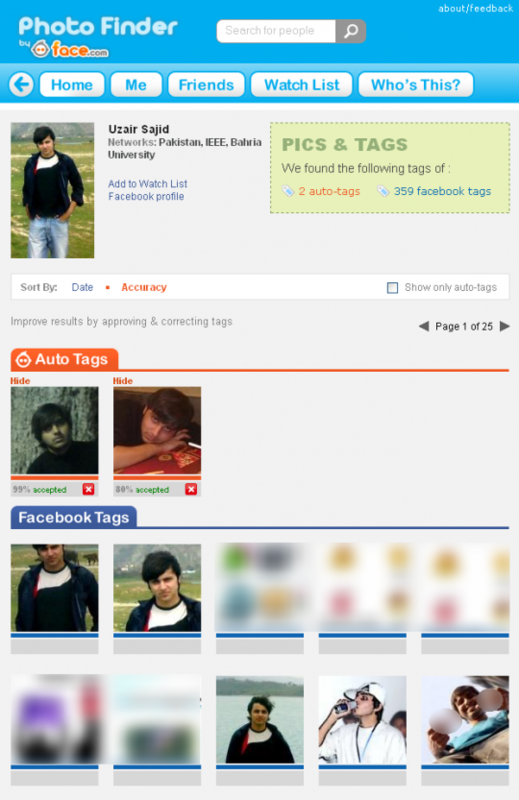 If the tags you placed were accurate, they would easily enable Photo Finder to identify those people in other photos it analyzes all around Facebook. This capability allows it to unearth photos of you and your friends you didn’t even know were published online. I personally discovered a lot of photos of me and my friends uploaded by other people which I didn’t know about. 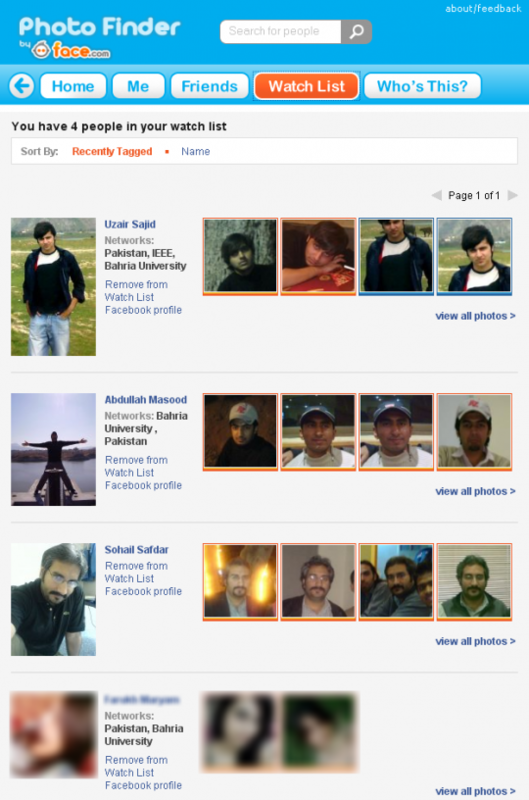 You can get all your photos in your profile page. 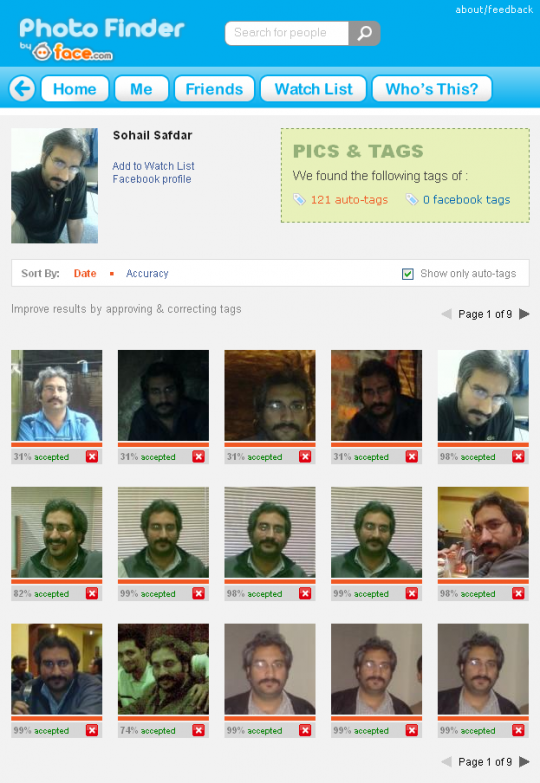 It does a great job of separating the manually tagged photos with those which are auto-tagged. If some photos are tagged inaccurately, you can always untag them. You can see newly discovered photos of friends even if they haven’t installed Photo Finder on their accounts. The application is able to pull out all the public photos around Facebook so that gives it a lot of raw data to build its knowledge upon. You can add specific friends to your watch-list to keep an eye out for those secret photos they didn’t want anyone to see. For photos which are incorrectly tagged, or Photo Finder is unable to identify the person, you can go to the Who’s this tab and help Photo Finder identify those people. 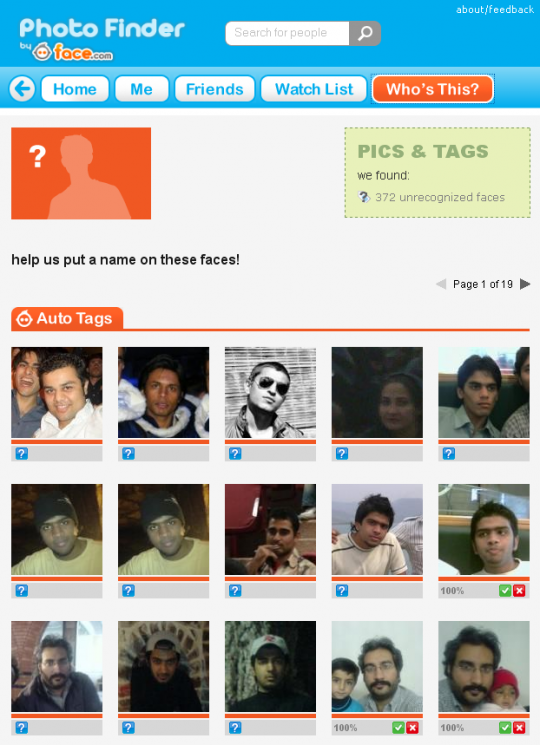 You can tag every face from your friends list even if they don’t have the application installed on their profiles. Photo Finder is still in its closed alpha testing days. We were invited to test the application for feature enhancements and bug fixes. During my initial testing, the application seemed to tag me in every face that had two eyes and a nose. But as its information database grew, it started behaving more accurately and can now identify and tag people in even the most hardly recognizable images. It definitely is the best Facial Recognition tool outside of Hollywood and the Department of Defense. I think that face.com is not providing this services to everyone right??? They are in closed alpha right now. They would launch the full application soon. Ran 39 queries in 0.184 seconds.